Narrative of the Life of Frederick Douglass, by Frederick Douglass. Kindle Edition. Original work published in 1845. Paperback edition, 82 pages. I hadn’t planned to re-read this autobiographical work by the famed orator, abolitionist and escaped Frederick Douglass. It wasn’t in my queue for the fall. However our kids were assigned excerpts from it in a lesson on persuasive literary techniques and in the 20 years since my first reading, there were large portions I’d forgotten. When unforeseen events found us on a road trip this weekend, I purchased the Kindle version of The Narrative for 0.99, using the travel time to reintroduce myself to Frederick Douglass’ brief but passionate recounting of his life in slavery, from his early years to his eventual escape and rise to prominence as a free man and respected abolitionist speaker and writer. I’m glad I reacquainted myself with it. For myriad reasons, I long ago made the decision not to expend significant time reexamining nor ruminating on the history of slavery in America. To the extent that we want our children to understand the fruit of human sin as well as the blessings they now enjoy, we teach them the history of their ancestors, including those ancestors still among us who haven’t always shared the freedom they enjoy. It means teaching the good as well as the bad. Those lessons however, are always balanced with the truth that they have enormous amounts of opportunities available to them as a result of earnest attempts at redress, no matter how imperfect. Their mission, should they choose to rise to the challenge of morality, industry, and integrity, is to seize it. Frederick Douglass, with no opportunity, and only bitter yokes of oppression somehow seized the reins of his destiny and emerged not only successfully, but triumphantly. He wasn’t content with the achievement of his own freedom. He had a deep Christian faith which sparked in him the desire to see all men be free. That is the moral of the Narrative of the Life of Frederick Douglass, alongside his fervent abolitionist message. And his narrative is indeed an excellent example to use as a tool to teach the principles of persuasive writing. To that end, I will keep this short and sweet by ending with a few persuasive and eloquent quotes from Douglass’ narrative. These words sank deep into my heart, stirred up sentiments within that lay slumbering, and called into existence an entirely new train of thought. It was a new and special revelation, explaining dark and mysterious things, with which my youthful understanding had struggled, but struggled in vain. I now understood what had been to me a most perplexing difficulty — to wit, the white man’s power to enslave the black man. It was a grand achievement, and I prized it highly. From that moment, I understood the pathway from slavery to freedom. It was just what I wanted, and I got it at a time when I the least expected it. Whilst I was saddened by the thought of losing the aid of my kind mistress, I was gladdened by the invaluable instruction which, by the merest accident, I had gained. This indeed is an excellent piece for exploring the power of persuasive rhetoric, and a powerful narrative of an important period in American history. I could go on, but the only other option is to paste the whole narrative here, which I don’t think is feasible. 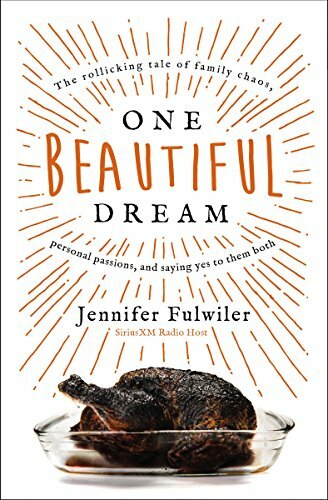 One Beautiful Dream: The rollicking tale of family chaos, personal passions, and saying yes to them both, by Jennifer Fulwiler. Published May 2018. 240 pages. As I got into this book then did a bit of digging, I realized that its author, Jennifer Fulwiler, is something of a Catholic Internet celebrity and as such, hardly as anonymous to the Catholic faithful as she was to me. I only heard of her because a paleo food blogger I happen to follow on Instagram heartily endorsed the book. One Beautiful Dream is best characterized as a memoir chronicling Fulwiler’s journey as a mother of six very closely spaced children alongside the pursuit of her dream to make it as a writer. A dream which I hasten to interject, was heartily encouraged by her husband, who repeatedly implored her not to give it up. I instantly liked this woman. She has a wicked sense of humor and a way of expressing it that I thoroughly enjoyed reading. I’ve said on numerous occasions that I am a slow reader. Nevertheless, I finished this book in two days. This was partly because the conversational tone makes it easy to read, and partly because rather than do my usual routine of bouncing between books when I have free time, I kept picking this one up, continuing to read it until the end. I found myself invested in seeing how Jennifer’s story would end even as I was turning the pages of its culmination. There’s another, deeper reason that this book resonated with me, and it was that I appreciated this woman’s gut wrenching wrestling match between pursuing her passion and trying to be a good wife and mother, a juggling act she admittedly bungled more often than not. She often wavered, wondering whether it was fair to her kids or right for a mother to devote large amounts of time and energy to such endeavors. That was, until she realized with the help of a wise priest’s counsel, that her insistence on compartmentalizing the segments of her life rather than cultivating an integrated life of wholeness was the root of her problem. Her life was chaotic (well, even more chaotic than a life with six kids under 10 is prone to be) because she failed to connect everything together. More than that, she needed to trust God that His will would be done in her life on His timetable. After nearly a decade blogging in and alongside the Christian/biblical womanhood Internet community before finally realizing the folly of formulaic living, this book was for me, a breath of fresh air. Not because I agree with everything Jennifer Fulwiler believes, does and says –I am a raging Protestant after all- but because she hits at the heart of the matter: She did what she did with the full encouragement and enthusiastic coaching of her husband, the cheer-leading of her children and support of her extended family which meant she did exactly what she was supposed to do, regardless of whether it offends the sensibilities of the “this is the way to be the perfect Christian wife” crowd. In my rush to get away, I had not looked into the details of this weekend before I signed up. And that, it now occurred to me, was a grave error. When all is said and done, this is a good book because the author shared her story in a funny, relatable, truthful way. She didn’t pretend to be perfect or have it all figured out, but she learned and grew in grace along the way. Which is the best any of us can really hope for this side of Heaven. The Hiding Place, by Corrie ten Boom. Originally published in 1971. 241 pages. This review, like the one before it, is of a book one of our kids was assigned as a part of a literature and writing course. I was already very familiar with Corrie ten Boom’s -and her family’s- story. So familiar in fact, that it had escaped me all these years that I had never actually read her story. Her memoir, recounting the story has inspired countless Christians since she originally penned it with the help of authors John and Elizabeth Sherrill, who learned of her while writing about another Dutch Christian, Andrew van der Bijl. Here is the Cliff’s notes version, for those who may not have heard the story. During WWII Corrie ten Boom, along with her entire family and at great personal risk and cost, opened their homes up as a hiding place for the Jews who were being rounded up after the German invasion of Holland in 1940. As a result of their efforts, they themselves were rounded up, imprisoned, suffered many hardships and suffering. Corrie’s father, and later her sister, both died in German prisons before Europe was liberated and the war ended. The real story here, for those who’ve read the book (or seen the movie), is the depth of the Christian faith and resolute foundation of God’s word on which the ten Boom family was built long before the war began. It was this faith that permeated the entire story, moved the ten Boom family to compassion rather than hatred of their invaders, and catapulted Corrie and her story into the history books. Our daughter has decided that Corrie ten Boom is an inspiration and someone whose faith she would do well to emulate. I wholeheartedly agree with her sentiments. However despite the fame and accolades that were poured onto Corrie as a result of her survival and story being retold, there is plenty of faith, love and hope to be found not only in Corrie’s story, but in that of her brother, father, extended family, and most of all her sister Betsie with whom Corrie served most of years of hard labor in the German prison. It would be nearly impossible for me to do this memoir the justice it deserves in the contest of a 50 word book review, and to add anything more would be to risk politicizing or trivializing a moving and compelling book; one from which the love of Christ, far more important than the details of the occupation, drips from every page. I highly recommend this book, and although I wish I had read it sooner, I’m happy to have read it late than never at all. Hillbilly Elegy: A memoir of a family and culture in crisis. By J.D. Vance. Published in 2016. 272 pages. I read this book last summer, have rolled it over in my head plenty since then, but haven’t taken the time to review it for a host of reasons I can’t well articulate. There was one thing I found quite telling. In the aftermath of our country’s most recent electoral circus, plenty of left leaning media pundits have called this book an insightful look into the mind of the Trump voter. It is not a compliment, I disagree with them, and I never got the feeling that Mr. Vance told his story for his people to be mocked. A dear friend, of Scotch-Irish descent born and raised in Appalachia who has long since forged a new life and path with her (non-Appalachian) husband and children, invited me to read her copy of this book on the heels of one of our discussions of race and culture. Despite it being a best seller, I’d never heard of it. It’s a fascinating book and my friend, I suspect, presumed it would get me to *get* the universality of certain experiences in a way that I didn’t, in her opinion. There were numerous accounts and recollections offered from J.D. Vance’s upbringing that I related to quite strongly. He offered examples and experiences that I could have written almost verbatim, but for the cast of characters and regional backdrop. This, even though I am as far removed from Appalachian culture as anyone I know. However what many thought was a revelation of a culture in crisis was to me, more of a family memoir with traces of what can happen to a people whose history and culture are increasingly alienated from the progressive march of the larger society. How to hold fast to the good about your history and culture while simultaneously equipping yourself to move forward id important. Whether or not everyone is able to do that is debatable. J.D Vance offers a lot of useful insights, realism, and counter cultural ideas for a guy who graduated from Yale Law and lived in one of the most liberal states in the country. Unfortunately he “lost his religion” as he navigated through all the twists and turns of his tumultuous family life. Nevertheless, he wrote a very good book, albeit one not without its critics. I however, am not among them. 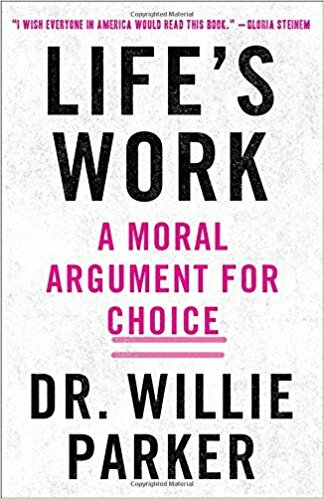 Life’s Work: A Moral Argument for Choice, by Dr. Willie Parker. Published in April, 2017. 224 pages. I used to have a master list of books I want to read, complete with a timetable for when and how I am going to read them. It never works out however, because I visit the library at least every other week, and every turn past the “featured titles” shelf has me leaving with some title which has piqued my curiosity and gotten me off the planned reading list schedule. This was one of those books. I don’t even know how to review it because although I find the philosophy, theology, worldview, and conclusions utterly wrong headed at best (repulsive at worst), Dr. Parker is a decent writer who wove together a good story and kept my attention throughout this book. None of that however, diminishes the problems with his logic and processing of the Christian faith. A black doctor who grew up poor in segregated Alabama, Dr. Parker was a fervent and passionate Christian from his teenage years onward, and still confesses Christ today. He held to Christian principles in practice even after becoming an OB/GYN physician, refusing to provide abortion services even as his compassion deepened for the women seeking abortions who came to the office he worked. He has a duty to extend Christian compassion to the women who come to him for abortion services by helping them end their unwanted pregnancies safely, and with little pain and complication as possible. They have as much right as any one else to fulfill their god-given potential and fulfill their dreams without having their lives thrown off track because of one mistake and a legal and societal culture who would judge them for it. Giving them their freedom and acknowledging their bodily autonomy is, in his opinion, the right thing to do. Of course, as always happens when liberals want to justify the unjustifiable, Dr. Parker repeatedly cites parallels between the freedoms of the women seeking abortions in 2017, and the freedom of the former slaves and black Americans who suffered all manner of indignities in the South. The first commandment of liberal theology: Every person who wants to do something immoral or unnatural and encounters opposition or delay is experiencing oppression equivalent to the descendants of the transatlantic slave trade. The second commandment is like unto it: True Christian love is demonstrated by a willingness to see to it that everyone has or is able to do what they need to feel accepted and good about themselves. Like I said, despite Parker’s unassailable way with words and compelling story telling there is nothing new to see here. Gloria Steinem’s rave review does nothing to change that. I did learn more about the medical intricacies of abortion than I ever wanted to know, complete with mental imagery I won’t soon forget. I learned a lot about the legalities of the debate as well. The most compelling parts of the book were Dr. Parker’s retelling of his life story, family history, and educational development. B+ for writing, D for philosophical content. Content advisory: In depth details on the procedures, nature, and aftermath of abortion in one chapter. I expect this to be the last post of 2016 so if I don’t get back here, have a wonderfully blessed Christmas and a Happy New Year! And keep reading! Little House in the Big Woods, by Laura Ingalls Wilder. Originally published in 1932. 256 pages. This book was our most recent bedtime read loud and our children enjoyed it immensely. They excitedly looked forward each night to what would happen next in the lives of Laura, Mary, Pa, and the rest of the Ingalls family. I’m not sure why it took me so long to get around the reading Laura Ingalls Wilder but I’m very glad that I finally did, and that I get to share it with my children. Children who, incidentally view the life and times of Laura and her family through an extremely idyllic lens. While they find the idea of life in the big woods highly desirable, I could not get past the though of woods and mountain lions right outside our door. The detail with which Laura Ingalls wilder described all that was involved in making maple syrup, butchering and curing animal meats, harvesting wheat, and other chores that were a common part of 19th century life were also a source of curiosity and research for the kids. I highly recommend these books for your upper elementary aged child. The illustrations in this particular edition are very well done and the kids liked the artwork as well. Some of the sketches were black and white, others in color, but all were beautiful. Because of the fascination and interest our kids had with this book, the first in the series which we will be continuing, we have started watching season one of the Little House television series that began in 1974. Because I was far too young to have watched or even remember those first few seasons, it has been an event for me as well. The kids were a little bummed that the episodes they have watched so far didn’t quite match up with the book. It provided a brief lesson on the ways that television shows and movies are adapted from books. If you haven’t read these books I recommend them. They are great books to read whether you are 12 years old, or 42. Food: A Love Story, by Jim Gaffigan. Originally published in 2014. 352 pages. I can honestly and unequivocally say that if you asked me for a genre of book I thought I would never, ever, be bothered to read, I’d probably say one like this: written by a modern day stand up American comedian. I have no idea what possessed me to grab this off the featured shelf of our library on my way to check-out kiosk. Something about the photo made me snicker, curiosity got the better of me, and my state of mind this holiday season demanded that I read something that might make me laugh. At least I hoped it would make me laugh, and thankfully, there were several moments as I read this book that literally made me laugh out loud. I read portions to members of our foodie household. The funny parts were so funny that I was able to forgive Mr. Gaffigan for the parts that were patently UN-funny. This is not high brow, not excellent writing, and book snobs need not even bother to crack the cover. I generally consider myself a book snob, but I’m prole enough to be able to kick back and laugh with someone as low brow as I am. I’m not going to even try and discuss this book from a literary perspective because that would mean pretending that it’s literary. The fact that Gaffigan keeps making the best seller list with these books says as much about American reading habits as his books reveal about American eating habits. It would be embarrassing trying to explain what an appetizer is to someone from a starving country. “Yeah, the appetizer—that’s the food we eat before we have our food. No, no, you’re thinking of dessert—that’s food we have after we have our food. We eat tons of food. Sometimes there’s so much we just stick it in a bag and bring it home. Then we throw it out the next day. Maybe give it to the dog. In America we have gone way beyond sustenance. Eating is an activity. It wasn’t defeat as much as it was acceptance. I figured, I got a hot wife. If she leaves me for getting fat, that means she’s shallow. I’d still trust an overly fat person over a skinny one any day. The best adviser would have a very specific body type: pudgy or just a little overweight. This makes it clear they have a somewhat unhealthy relationship with food, but not a clinical problem.If they are morbidly obese, then you can conclude that they will probably eat everything and anything and do not have discerning taste. My favorite part was probably his exploration of how dumb we have to be to have made bottled water into a multi-billion dollar industry. He even notes that Evian is “naive” spelled backwards, which I somehow never noticed. Recently I tried Smartwater, which has electrolytes in it, and it’s supposed to replenish your body better than regular bottled water, therefore making you, I guess, smarter. I tried it, and it totally worked. I am now much smarter. Now I only drink tap water. Foodies will travel for miles in search of the perfect hamburger. “There is this place in Greenpoint that’s only an hour by train and a forty-minute walk from the subway that has the best burger in town!” It can’t be better than the burger I can get across the street. Mostly, I just want the closest best burger in town. Yep, we drive for a great…whatever. We even got excited about trying a new local vegan donut shop and we’re as far from vegan as you can get. Like I said, I laughed, which was the whole point. This book was basically a 300+ page stand up act, with all this implies: Some great hits, and some big misses. Content advisory: The occasional four letter word here and there, but very rare.